When you initially set up your Linksys Wi-Fi Router, the Linksys Connect software automatically assigns a similar wireless network name (SSID) and password for both the 2.4 GHz and 5 GHz band. To easily identify and connect to your 5 GHz wireless network name, it is recommended that you give it a new name and password. The less crowded 5 GHz wireless band offers significantly improved performance compared to the more common 2.4 GHz wireless band. If you want to know more about why connecting to a 5 GHz network is ideal, click here. Access the router's web-based setup page using Linksys Connect. To learn how, click here. For instructions on how to manually access the router’s web-based setup page, click here. IMPORTANT: When making changes to the settings of the router, make sure to do it using a computer wired to the router. If you are using a laptop or any wireless computer, temporarily connect an Ethernet cable from one of the Ethernet ports of the router going to the Ethernet port of your laptop or wireless computer. 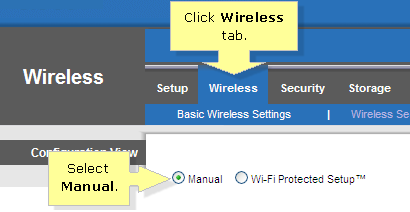 On the web-based setup page of your Linksys Wi-Fi Router, click on the Wireless tab and select Manual. NOTE: The details of your router’s current wireless settings will be displayed. On the Basic Wireless Settings page, look for the 5 GHz Wireless Settings category located at the left hand side and enter your new wireless network name (SSID) according to your preference. Then click on Save Settings to apply the changes. QUICK TIP: You can retain the original SSID but may add a “- 5 GHz” suffix for you to be able to identify the 5 GHz network easily. You will then receive a confirmation window stating that the Settings are successful. Click on the Continue button to return to the previous page. On the router’s web-based setup page, click on the Wireless tab and click on the Wireless Security sub-tab. This will display your Linksys Wi-Fi Router’s current wireless security settings. Look for the 5 GHz Wireless Security category and enter in a new Passphrase according to your preference. Click on Save Settings. NOTE: This will be the new password for your 5 GHz Wireless Network (SSID). Make sure to take note of your passphrase or password. NOTE: Connecting to your wireless network will vary depending on your computer’s operating system. In this example, the operating system used is Windows XP. If you're using another operating system, click here for more detailed instructions. Right-click on the Wireless Network Connection icon on your system tray and select View Available Wireless Networks. The Choose a wireless network window will now appear on your screen. Select your wireless network name (SSID) from the list and click on the Connect button. NOTE: If your 5 GHz wireless network is not listed, try disconnecting the power cord from your router, and then reconnect it after 10 seconds. NOTE: If you are unable to see the wireless network name (SSID) of your 5 GHz network, make sure that you have not set the SSID Broadcast to Disabled. A window will prompt you to enter a Network key, which is the password you specified earlier. Enter your password in the allocated Network key field. Then, carefully enter it again in the Confirm network key field. Click on the Connect button to connect to your wireless network. QUICK TIP: For Windows 7 or Vista, Network key is referred to as Security Key or Passphrase. Your wireless computer should now be connected to the 5 GHz wireless network.